Fright Night starts in Salford at The Eagle Inn this week, with a theatre experience certainly not for the faint at heart. Sarah Adie gets spooked. Collier Street in Salford after dark on a misty mid-October evening is a little haunting. If you’ve never been there before and your first experience of the 100-year-old pub is standing outside with a group of strangers in the dark, surrounded by derelict buildings, being screamed at by a very burly tattooed landlord for hanging around in the cold, before being invited in to be regaled by tales of punters being murdered and turned into kerosene, it’s downright terrifying. But don’t worry – this isn’t your average night at The Eagle. It’s just the premise of House of Orphans‘ and Working Progress‘s play Lamp Oil, A Haunted Tale for Halloween. The premise is thus – the gathered audience (that’s you and me) is there to see a play but, before it starts, one of the regulars drunkenly reveals some rather dark secrets about the pub’s past… and then all hell breaks loose. This really is experience-based theatre at its best and if you’re on the lookout for a novel scare this All Hallow’s Eve, then a visit to The Eagle Inn is definitely in order. The acting’s at a premium (particularly Mark Sheals, who is the most believable Salford bartender ever) and there are shocks and what-the-hell moments at every turn. It won’t be to everyone’s liking but if you want to try something different, love a bit of audience involvement and believe that sitting down to see a play is just oh-so passé, then this is the production for you. Just remember to wear sensible shoes – they make running away so much easier than heels. 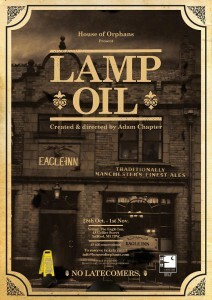 Lamp Oil is on between now and Thursday 1 November, with tickets priced at £8/£6 (conc). Email info@houseoforphans.com to reserve tickets and avoid disappointment. Well written, excellently performed .